“Delbert Barker was born on a farm in Frenchberg, Kentucky on December 3, 1932 and moved to Middletown, Ohio, near Cincinnati, in 1943. During his teens, he began participating in amateur talent contests and eventually gained sufficient confidence to turn semi-pro, appearing on local radio and TV. “Between 1951 and 1953, he performed alongside other local favourites (including the Davis Sisters) on Mid-Day Merry Go-Round, a daytime show on WCPO-TV Cincinnati. These appearances brought Barker to the attention of Paul Burkhardt, who ran a small recording studio and pressing plant, and specialized in producing cheap cover versions of recent hits on low-budget labels, such as Queen City, Kentucky and Tops. 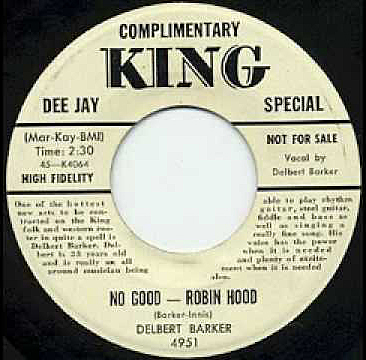 Between 1951 and 1954, the versatile and adaptable Barker worked as a session vocalist for Burkhardt, recording over 100 tracks, some of which were released as singles on the Kentucky label with the remainder appearing on EPs and LPs with titles like Four Big Hits and 16 Top Hits. 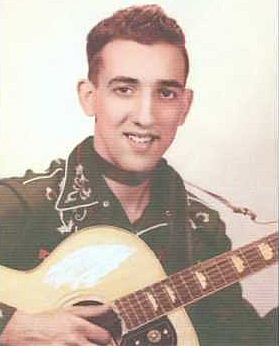 ‘I had five different voices,’ Barker says, ‘I did Carl Smith, Hank Williams, Hank Thompson, Faron Young and some Lefty Frizzell.’ Marriage took Barker out of the music business until early 1956 when he recorded a creditable version of ‘Blue Suede Shoes’ under the pseudonym, Terry Wall, for Burkhardt’s Hep label.